Greek: Hotan de nesteuete, (2PPAS) me ginesthe (2PPMM) hos hoi hupokritai skuthropoi, aphanizousin (3PPAI) gar ta prosopa auton hopos phanosin (3PAPS) tois anthropois nesteuontes; (PAPMPN) amen lego (1SPAI) humin apechousin (3PPAI) ton misthon auton. KJV: Moreover when ye fast, be not, as the hypocrites, of a sad countenance: for they disfigure their faces, that they may appear unto men to fast. Verily I say unto you, They have their reward. Wuest: Moreover, whenever you are fasting, stop being like the actors on the stage of life, of a sad and gloomy countenance, for they mask their faces in order that they may appear to men as those who are fasting. Assuredly, I am saying to you, they have their reward and the receipt for the same in full. Young's Literal: And when ye may fast, be ye not as the hypocrites, of sour countenances, for they disfigure their faces, that they may appear to men fasting; verily I say to you, that they have their reward. Before you read the notes consider Meditating on these passages on FASTING - Specifically what practice is clearly associated with fasting? Interesting! Are you practicing (under grace, enabled by the Spirit) this Biblical truth in your spiritual life (or will you? will I?)? Matt 9:14 Then the disciples of John came to Him, saying, “Why do we and the Pharisees fast, but Your disciples do not fast?” 15 And Jesus said to them, “The attendants of the bridegroom cannot mourn as long as the bridegroom is with them, can they? But the days will come when the bridegroom is taken away from them, and then they will fast. Neh 1:4 Now it came about when I heard these words, I sat down and wept and mourned for days; and I was fasting and praying before the God of heaven. Ps 109:24 My knees are weak from fasting; And my flesh has grown lean, without fatness. Dan 9:3 So I gave my attention to the Lord God to seek Him by prayer and supplications, with fasting, sackcloth, and ashes. Luke 2:37 and then as a widow to the age of eighty-four. And she never left the temple, serving night and day with fastings and prayers. Acts 13:3 Then, when they had fasted and prayed and laid their hands on them, they sent them away. Acts 14:23 And when they had appointed elders for them in every church, having prayed with fasting, they commended them to the Lord in whom they had believed. 1Cor 7:5 (A different genre of "fasting") Stop depriving one another, except by agreement for a time that you may devote yourselves to prayer, and come together again lest Satan tempt you because of your lack of self-control. So Jesus is not teaching on whether we should fast or not. He is assuming we will fast and teaching us how to do it and, especially, how not to do it. An important point to notice in the Sermon on the Mount is that fasting is paralleled with benevolent giving and with prayer. Christ spoke on these three subjects using exactly the same wording: “When you give alms” (Matthew 6:3); “And when you pray” (Matthew 6:5); “Moreover when you fast… ” (Matthew 6:16). Just as giving and prayer are ordinances of God, so is fasting. As with all the spiritual disciplines, it is not the mere performance that God desires, but the proper motive of the heart. In the Sermon on the Mount Christ teaches us what would be an improper and hypocritical motive—”that you may not appear unto men to fast, but unto your Father which is in secret; and your Father who sees in secret will reward you openly” (Matthew 6:16, 17, 18). Several other false motives are delineated in God’s chapter on fasting (Isaiah 58) which include afflicting the soul to attract God (Is 58:3), to do fleshly pleasures (Is 58:3), or to be seen in public (Is 58:4). Even the rigor and the formality of habitual fasting are destructive if that becomes the motive (Luke 18:12, 13, 14). Fasting, or occasional abstinence from food in order to bring the body into subjection to the spirit, is a practice frequently mentioned in the Bible, generally in connection with prayer. David fasted when his child was sick (2 Samuel 12:16); Daniel fasted when he sought special light from God (Daniel 9:3); Paul and Barnabas fasted when they appointed elders (Acts 14:23); Esther fasted before going in to Ahasuerus (Esther 4:16). It is a subject about which we find no direct command in the New Testament. It seems to be left to everyone’s discretion, whether he will fast or not. In this absence of direct command we may see great wisdom. Many a poor man never has enough to eat, and it would be an insult to tell him to fast: many sick people can hardly be kept well with the closest attention to diet, and could not fast without bringing on illness. It is a matter in which each person must be persuaded in their own mind, and not rashly condemn others who do not agree. One thing only must never be forgotten: those who fast should do it quietly, secretly and without ostentation. Let them not “show men they are fasting.” Let them not fast to man, but to God. Having dealt with prayer, our King now instructs us as to fasting. Fasting took a leading place in devotion under the Law, and it might profitably be more practiced even now under the Gospel. The Puritans called it “soul-fattening fasting”, and so many have found it. We must, by order of our King, avoid all attempt at display in connection with this form of devotion. Hypocrites went about with faces unwashed, and dolorous, that all might say, “See how rigidly those men are fasting. What good men the, must be!” To look miserable in order to be thought holy- is a wretched piece of hypocrisy; and as it makes fasting into a trick to catch human admiration, it thereby destroys it as a means of grace. We cannot expect to get a reward both from the praise of our fellows and the pleasure of God. Fast (3522) (nesteuo from ne- = not + esthío = to eat) means to abstain from food for a certain length of time. Fasting consisted of abstinence from food to express dependence on God and submission to His will. NIDNTT - says Nesteuo is from ne-, particle of negation, and edo, eat, i.e. not eating) means, having an empty stomach. Manser - Abstaining from food, and possibly drink, for a limited period of time as a mark of religious commitment and devotion or as an expression of repentance for sins. To fast is to abstain for a limited period from any kind of food. (Total and permanent abstinence from particular, “forbidden” foods is a quite separate matter.) What is the real motive for fasting? In the pagan religions of the ancient world, it was clearly fear of demons and the idea that fasting was an effective means of preparing oneself for an encounter with the deity, since it created the right kind of openness to divine influence. For this reason it belonged in the mystery religions to the ritual of initiation for novices. In magic and with the oracles fasting was also often regarded as a preparation necessary to success. The custom of fasting following a death was widespread. While the soul of the dead person is still near, there is danger of demonic infection in eating and drinking. Fasting was also required, for instance, in certain fertility rites. Thus at Athens he Nesteia is the name given to the fast-day in the women’s fertility festival in the month of sowing (October). Abstinence, here including particularly sexual abstinence, makes a person readier to receive the divine powers of fertility. In practice, fasting in the setting of religious rites and as a defence against trouble was common in the whole of the ancient world, but not fasting for ethical motives (asceticism). In the LXX the Greek words represent the Heb. sûm, fast. Along with this the MT has 'innâh nepes, afflict oneself (lit., humble one’s soul), referring to a purification rite in which fasting played a part (Lev. 16:29, 31; 23:27, 32; Num. 29:7; Isa. 58:3; Ps. 35:13). Frequently too we read simply of “eating no bread and drinking no water” (e.g. Ex 34:28). (a) It was practised by the individual, when oppressed by great cares (2 Sam. 12:16-23; 1 Ki. 21:27; Ps. 35:13; 69:10). (b) It was practised by the nation in imminent danger of war and destruction (Jdg. 20:26; 2 Chr. 20:3; Est. 4:16; Jon. 3:4-10; Jud. 4:9, 13); during a plague of locusts (Joel 1 and 2); to bring success to the return of the exiles (Ezr. 8:21-23); as an expiatory rite (Neh. 9:1); and finally in connection with mourning the dead (2 Sam. 1:12). Fasting and prayer go constantly together (Jer. 14:11-12; Neh. 1:4; Ezr. 8:21, 23). Fasting usually lasts from morning to evening (Jdg. 20:26; 1 Sam. 14:24; 2 Sam. 1:12), although Est. 4:16 tells of a 3-day fast. In the description in Ps. 109:24 the torments of fasting during the period of accusation are at the same time a reflection of the inward torments suffered by the suppliant. Lowery - Fasting consisted of abstinence from food to express dependence on God and submission to his will (cf. Mt 4:1). The fasting Jesus refers to is private fasting, probably done as an aid to prayer (cf. Luke 2:37). Although the early church collectively fasted and prayed (e.g., Acts 13:3, 14:23), it seems to have been done primarily by Jewish Christians. 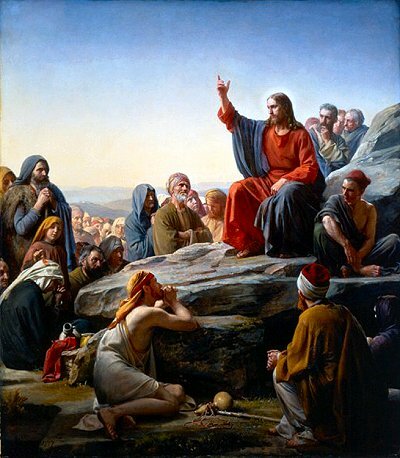 The practice is never mentioned in any of the NT letters and while Jesus is with them the disciples do not fast (Mt 9:14). Like alms and prayer, fasting is to be done as an act of devotion to God and not to win the approval of anyone else. (Matthew - The Bible Knowledge Key Word Study). Matthew 4:2 And after He had fasted forty days and forty nights, He then became hungry. Matthew 6:16 "Whenever you fast, do not put on a gloomy face as the hypocrites do, for they neglect their appearance so that they will be noticed by men when they are fasting. Truly I say to you, they have their reward in full. 17 "But you, when you fast, anoint your head and wash your face 18 so that your fasting will not be noticed by men, but by your Father who is in secret; and your Father who sees what is done in secret will reward you. Matthew 9:14 Then the disciples of John came to Him, asking, "Why do we and the Pharisees fast, but Your disciples do not fast?" 15 And Jesus said to them, "The attendants of the bridegroom cannot mourn as long as the bridegroom is with them, can they? But the days will come when the bridegroom is taken away from them, and then they will fast. Spurgeon: But Jesus was to go. He says himself, “The Bridegroom shall be taken from them.” Here first He speaks about His death. Did His disciples note the warning word? When their Beloved was gone, they would have fasting enough. How true was this! Sorrows crowded in upon them when He was gone. It is the same with us. Our Lord is our joy: His presence makes our banquet; His absence is our fast, black and bitter. All Ritualistic fasting is the husk: the reality of fasting is known only to the child of the bride chamber when His Lord is no more with Him. This is fasting indeed, as some of us know full well. There is no wedding without a Bridegroom, no delight without Jesus. In his presence is fulness of joy; in his absence is depth of misery. Let but the heart rest in his love and it desireth nothing more. Take a way a sense of his love from the soul, and it is dark, empty, and nigh unto death. John MacArthur: The Old Testament prescribed only one fast, the one on Yom Kippur, the Day of Atonement (see Lev. 16:29, 31, where the phrase “humble your souls” [from the Heb. ˓āna, “to afflict or humble”] commonly included the idea of refraining from food). But Jewish tradition had come to require fasting twice a week (see Luke 18:12), and these disciples were careful to follow that practice. Along with alms giving and certain prescribed prayers, twice-weekly fasting was one of the three major expressions of orthodox Judaism during Jesus’ day. The scribes and Pharisees looked on these practices with great seriousness and were careful not only to follow them faithfully but to do so as publicly and ostentatiously as possible-ostensibly as a testimony to true godliness but in reality as a testimony to their own self-styled piety. When they gave alms, they blew trumpets “in the synagogues and in the streets” in order to “be honored by men” (Matt. 6:2). When they prayed “in the synagogues and on the street corners,” they did so “to be seen by men” (Mt 6:5). And when they fasted, they “put on a gloomy face” and neglected their “appearance in order to be seen fasting by men” (Mt 6:16). They did not see religion as a matter of humility, repentance, or forgiveness, but as a matter of ceremony and proud display. And therefore the external rituals which they paraded as badges of godly righteousness actually marked them as ungodly hypocrites, as Jesus declared in each of the three verses just cited (cf. Mt 5:20). Mark 2:18 John's disciples and the Pharisees were fasting; and they came and said to Him, "Why do John's disciples and the disciples of the Pharisees fast, but Your disciples do not fast?" 19 And Jesus said to them, "While the bridegroom is with them, the attendants of the bridegroom cannot fast, can they? So long as they have the bridegroom with them, they cannot fast. 20 "But the days will come when the bridegroom is taken away from them, and then they will fast in that day. 21 "No one sews a patch of unshrunk cloth on an old garment; otherwise the patch pulls away from it, the new from the old, and a worse tear results. J C Ryle has some interesting comments: These words, we must of course see, were a parable. They were spoken with a special reference to the question which the Pharisees had just raised--"Why do the disciples of John fast, but your disciples do not FAST?" Our Lord's reply evidently means, that to enforce fasting among His disciples would be inexpedient and unseasonable. His little flock was as yet young in grace, and weak in faith, knowledge, and experience. They must be led on softly, and not burdened at this early stage with requirements which they were not able to bear. Fasting, moreover, might, be suitable to the disciples of Him who was only the Bridegroom's friend, who lived in the wilderness, preached the baptism of repentance, was clothed in camel's hair, and ate locusts and wild honey. But fasting was not equally suitable to the disciples of Him, who was the Bridegroom Himself, brought glad tidings to sinners, and came living like other men. In short, to require fasting of his disciples at present, would be putting "new wine into old bottles." It would be trying to mingle and amalgamate things that essentially differed. Luke 5:33 And they said to Him, "The disciples of John often fast and offer prayers, the disciples of the Pharisees also do the same, but Yours eat and drink." 34 And Jesus said to them, "You cannot make the attendants of the bridegroom fast while the bridegroom is with them, can you? 35 "But the days will come; and when the bridegroom is taken away from them, then they will fast in those days." Comment: Perfect example of "bad" fasting. Pride puffed up fasting. Acts 13:2 While they were ministering to the Lord and fasting, the Holy Spirit said, "Set apart for Me Barnabas and Saul for the work to which I have called them." 3 Then, when they had fasted and prayed and laid their hands on them, they sent them away. Fasting is a valid discipline and one which Jesus did not annul. The only fast God commanded was once per year on the Day of Atonement. The Jewish religious teachers had added two fasts to be performed each Monday and Thursday, a practice which was observed ritualistically by the "pious" Pharisees. Fasting has been practiced by many different religions for centuries. It is personal self-discipline in which a person denies himself a normal need in order to learn to restrain his passions and desires, and to express his devotion. Often God’s people have fasted in order to express humility before the Lord, and to show an earnest desire for the Lord to work in a particular way. Most commonly, fasting involves denying oneself a meal or meals in order to give oneself to the purpose of seeking God’s face. But fasting is never to be used for drawing attention to one’s spirituality or devotion… The gloomy, sullen looks on their faces give the pretentious fasters a ready audience. The language suggests an almost unrecognizable look, as they leave their hair disheveled, neglect bathing, and maybe even accentuate a strange pallor to the skin. What principles for fasting are given in Matthew 6:16-18? Don't fast like a hypocrite, putting on a gloomy face to impress men - that's your entire reward! If you give, pray or fast for the admiration of man, you will lose the smile and reward of your Father! When you fast take care of your appearance so men don't know you are fasting - then your Father will repay you. Notice that Jesus says "when you fast" not "if you fast" indicating it is expected by our Lord. However, He does not command fasting. Thus fasting is a choice we each must make. It is a voluntary spiritual discipline. Fasting is a Christian’s voluntary, non-coerced abstinence from food or water for spiritual purposes. Fasting by a non-Christian has no eternal value since the discipline’s motives and purposes are to be God-centered. Fasting runs counter to America's self-indulgent, "me, my, mine" mindset, and thus it is not surprising that many Christians have not given serious consideration to the discipline of fasting. The act of fasting directly opposes the desires of our fallen flesh, which are continually appealed to by the world and the tempter. Of course, there are some people who cannot and should not fast because of medical reasons. However, for the majority of Christians, it be prudent to consider engaging in the practice of fasting, as saints have done throughout the Old Testament and in the early church (cf Acts 13:2, 3, 14:23). Fasting is not to impress God not to earn His acceptance, our acceptance having been made full and complete on the basis of the finished work of the Lord Jesus Christ. Fasting does not earn God’s favor! Like alms and prayer, fasting is to be done as an act of devotion to God and not to win the approval of anyone else. When we fast, we must not do anything that will draw attention to our appearance, our hungry state or our dedication to God. Fasting is between the saint and his God. Fasting is mentioned in Scripture more than several other important doctrines including such teachings as baptism (about 77 times for fasting, 75 for baptism). Most believers have been baptized but how many have fasted? Fasting in Scripture is almost always associated with prayer. Some feel that fasting helps one focus our prayers of intercession and supplication. We should not however assume that fasting is like a "spiritual hunger strike" that in any way compels or manipulates God. Clearly, if we petition for something out of God’s will, fasting does not incline Him produce an affirmative response. In short, fasting does not change God’s hearing so much as it changes our praying. Fasting for God's guidance is clearly seen in Scripture (see Jdg 20, Acts 14:23), but fasting does not ensure certainty that we will receive clear guidance. On the other hand, fasting rightly motivated does make us more receptive to our Father Who seeks to guide us. Here God Himself associates fasting with a changed change (repentance) and a return to Him. This passage also warns that fasting without a changed heart is a meaningless dead work. Beloved, is God calling you to deal with a specific sin in your hardened heart, so that you might return to Him in brokenness and repentance with fasting, weeping and mourning? Jesus promised that blessed are those mourn over their sins for they shall be comforted (see Mt 5:4-note) Don't try to substitute a spiritual discipline such as fasting, for God' clear call to confess and forsake that sin which so easily entangles you (cf Pr 28:13). It is a perversion of fasting from food or drink when we refuse God's "chosen fast" (cf Isaiah 58:3, 4, 5, 6, 7, 8, 9, 10, 11, 12, especially v6-7) to cease feeding a sin we want to continue feeding. The Jews of Jesus' day had a teaching that Moses went up on Mount Sinai to receive the Law on a Thursday, and returned with it on a Monday. Consequently, the Pharisees considered fasting on those two days was considered a special mark of holiness. Nehemiah had a deep sense of Jerusalem’s significance to God and was greatly distressed that affairs there had not advanced the cause and glory of God. Note that Nehemiah's focus was toward the God of heaven and for the glory of God. When I fast is that my focus and my goal? Anna is one of those people that I cannot wait to meet. Luke gives details of her life which suggest that for well over half a century she was at the Temple serving God with “fastings and prayers.” Clearly for Anna, her fasting as an incredible expression of worship to her Lord. Here we see fasting can be an expression of finding one's greatest pleasure and enjoyment in God. May you and I dear reader yearn for times when God causes us like Anna to crave the spiritual banquet of His presence more than any physical, temporal and earthly meal. Remember that Jesus promises that our Father in heaven will reward us when He sees a rightly motivated, pure in heart fast for His eyes only. “Food will not commend us to God; we are neither the worse if we do not eat, nor the better if we do eat” (1Co 8:8). Only one went down to his house justified (Luke 18:12, 13, 14). “All things are lawful for me, but I will not be mastered by anything” (1Corinthians 6:12). “Food is for the stomach and the stomach is for food” (1 Corinthians 6:13). Irreligiously, with no pretext of pardoning grace, persons simply yield to “the desires for other things [that] enter in and choke the word” (Mark 4:19). “Desires for other things”—there’s the enemy. And the only weapon that will triumph is a deeper hunger for God. Matt 6:2 “When therefore you give alms, do not sound a trumpet before you, as the hypocrites do in the synagogues and in the streets, that they may be honored by men. Truly I say to you, they have their reward in full. 5 “And when you pray, you are not to be as the hypocrites; for they love to stand and pray in the synagogues and on the street corners, in order to be seen by men. Truly I say to you, they have their reward in full. 1Kgs 21:27 And it came about when Ahab heard these words, that he tore his clothes and put on sackcloth and fasted, and he lay in sackcloth and went about despondently. Do not put on a gloomy face - Young's rendering is more literal "be ye not as the hypocrites, of sour countenances". The present imperative is a command that is coupled with a negative particle (Greek = "me") which calls for them to stop this practice. Gloomy (4659) (skuthropos from skuthros = sullen, grim + ops = countenance) means to look sad, somber, downcast or gloomy. I heard persons speak of certain emaciated ecclesiastics as being such wonderfully holy men. “How they must have fasted! They look like it. You can see it in their faces.” Probably produced by a fault in their digestion much more likely, than by anything else and if not — if we are to suppose that the spareness of a man a person is to be the token of his holiness — then the living skeleton was a saint to perfection. But we are not beguiled by such follies as these. The Christian man fasts but he takes care that no one shall know it. He wears no ring or token even when his heart is heavy. Full often he puts on a cheerful air, lest by any means he should communicate unnecessary sorrow to others, and he will be cheerful and happy, apparently, in the midst of company, to prevent their being sad, for it is enough for him to be sad himself, and sad before his Father’s face. Do not imagine that the appearance of sadness indicates sanctity—it often means hypocrisy. To conceal one’s own griefs for the sake of cheering others implies a self-denying sympathy which is the highest kind of Christianity. Noticed by men - This is the reward the hypocrites desire. If we are honest, we will all agree that it is in a sense "rewarding" when others compliment us on our spiritual discipline, zeal, or devotion? How you fast depends on whom you want to impress. If your fast is for your spiritual benefit and God’s glory, no one else needs to applaud your commitment. was guileless in all His ways, and He calls for absolute honesty in the behavior of His disciples. Let him who is abstaining from food or other things in order to have more time with God, cultivate a cheerful manner as becomes one who enjoys communion with the Father. Reward in full - Jesus is saying that that if you love to be "rewarded" with praise and admiration from people, you will receive that "reward" but nothing more. The sacrifice of the personal will, which gives to fasting all its value, is expressed in the old term used in the law, afflicting the soul . Fasting is usually born out of a need (approaching danger, approaching judgment, death of someone, ordination of ministers) as shown especially in the occasions mentioned above. Are you seeking God or seeking to manipulate God? Fasting calls us from the preoccupations of body and soul in the day-by-day pressures of life. It summons us into such serious communion with our Lord that we voluntarily abstain from our normal absorption with such needs as food and drink. Fasting although national at times is predominantly a private matter, an expression of personal devotion linked to three major crises lamentation/penitence, mourning, and petition. Without exception fasting has to do with a sense of need and dependence, of abject helplessness in the face of actual or anticipated calamity. As an expression of lamentation and/or penitence, fasting nearly always is associated with weeping (Judges 20:26; Esther 4:3; Psalm 69:10; Joel 2:12), confession (1Sam 7:6; Da 9:3), and the wearing of sackcloth (1Ki 21:27; Neh 9:1; Esther 4:3; Psalm 69:10; Da 9:3). Fasting was frequently associated with supplication (prayer). David prayed and fasted over his sick child (2Sa 12:16), weeping before the Lord in earnest intercession (2Sa 12:21, 22). Nehemiah, having heard of Jerusalem's desolation, wept, fasted, and prayed that God would give him favor with King Artaxerxes of Persia so that he might return to his homeland and repair its ruins (Neh 1:4-11). Esther, under similar circumstances, urged Mordecai and the Jews to fast for her as she planned to appear before her husband the king (Esther 4:16). Clearly, fasting and petition are here one and the same (cf. Jer 14:12). It is interesting that the purpose of fasting is never explicitly stated in Scripture. From the Scriptural examples connecting fasting to penitence, mourning, and supplication it appears that fasting is a means of self-denial that opens one to God. Fasting is a spiritual practice in which believers are given the opportunity to express themselves in an undivided and intensive devotion to the Lord. The sole fast required by the law of Moses was that of the great Day of Atonement, Leviticus 23:26, 27, 28, 29, 30, 31, 32. It is called "the fast" (Acts 27:9). The fast of the fifth month, kept on the ninth of Ab (Compare Numbers 14:27), to commemorate the burning of the city and temple (Jeremiah 52:12,13). The fast of the seventh month, kept on the third of Tisri (Compare 2Kings 25), the anniversary of the murder of Gedaliah (Jeremiah 41:1,2). The fast of the tenth month (Compare Jeremiah 52:4; Ezekiel 33:21; 2KIngs 25:1), to commemorate the beginning of the siege of the holy city by Nebuchadnezzar. There was in addition to these the fast appointed by (Esther 4:16). By the ninth century BC fasting had become institutionalized or formalized to the extent that days or other periods of fasting were called as occasions for public worship. The usual way of describing such convocation is "to call for" or "proclaim" a fast. Thus, Jezebel, to provide an occasion whereby Naboth would be unjustly accused and condemned, proclaimed a fast (1Kings 21:9,12). Jehoshaphat later, and with much nobler motives, called for such an assembly in order to implore God's intercession on Judah's behalf (2Chr 20:3). The same formula appears in Ezra 8:21 and Jonah 3:5, in the last instance initiated by the people of Nineveh as an expression of their repentance at Jonah's preaching. Public national fasts on account of sin or to supplicate divine favour were sometimes held. There were also local fasts. Jonah 3:5, 6, 7, 8, 9. There are many instances of private occasional fasting (1Samuel 1:7: 20:34; 2Sa 3:35; 12:16; 1Ki 21:27; Ezra 10:6; Ne 1:4; Da 10:2,3). The instances given of individuals fasting under the influence of grief, vexation or anxiety are numerous. Moses fasted forty days (Exodus 24:18; 34:28), and so also did Elijah (1Kings 19:8). Our Lord fasted forty days in the wilderness (Matthew 4:2). In the lapse of time the practice of fasting was lamentably abused (Isaiah 58:4; Jeremiah 14:12; Zechariah 7:5). Our Lord rebuked the Pharisees for their hypocritical pretences in fasting (Matthew 6:16). He himself appointed no fast. The early Christians, however, observed the ordinary fasts according to the law of their fathers (Acts 13:3; 14:23; 2Cor 6:5). In the New Testament the only reference to the Jewish fasts are the mention of "the fast" in (Acts 27:9) (generally understood to denote the day of atonement) an the allusions to the weekly fasts. (Matthew 9:14; Mark 2:18; Luke 5:33; 18:12; Acts 10:30) These fasts originated some time after the captivity. If the solemnities of our fasting, though frequent, long and severe, do not serve to put an edge upon devout affections, to quicken prayer, to increase Godly sorrow, and to alter the temper of our minds, and the course of our lives, for the better, they do not at all answer the intention, and God will not accept them as performed to Him. Prayer needs fasting for its full growth. Prayer is the one hand with which we grasp the invisible. Fasting is the other hand, the one with which we let go of the visible. Jesus' point is that when a hypocrite fasts, and not only does he not conceal it but he makes it plain to others that he is fasting. But if hypocrisy means "putting on a mask", it would seem at first glance that anointing your face, etc, is hiding from others what you are doing. Isn't hypocrisy trying to look different on the outside from what you really are on the inside? Jesus says that hypocrites demonstrate to others that they are fasting, because as in all of the Sermon on the Mount, He is gazing into our hears! Ouch! J C Ryle (1816-1900) - Let us learn from our Lord’s instruction about fasting, the great importance of cheerfulness in our religion. Those words, “anoint thy head, and wash thy face,” are full of deep meaning. They should teach us to aim at letting men see that we find Christianity makes us happy. Never let us forget that there is not religion in looking melancholy and gloomy. Are we dissatisfied with Christ’s wages, and Christ’s service? Surely not! Then let us not look as if we were. Greek: hopos me phanes (2SAPS) tois anthropois nesteuon (PAPMSN) alla to patri sou to en to kruphaio; kai o pater sou o blepon (PAPMSN) en to kruphaio apodosei (3SFAI) soi. KJV: That thou appear not unto men to fast, but unto thy Father which is in secret: and thy Father, which seeth in secret, shall reward thee openly. Wuest: in order that you may not appear to men to be fasting but to your Father who observes in the sphere of the secret, and your Father who observes in the sphere of the secret will reward you. Young's Literal: that thou mayest not appear to men fasting, but to thy Father who is in secret, and thy Father, who is seeing in secret, shall reward thee manifestly. Noticed by men - Let's all be honest. Whether we have walked with Christ 1 year or 30 years, is this not a challenge in ever area of Christian endeavor, be it preaching, teaching, ushering, etc? O, how easy it is to do religious things if other people are watching! Preaching, praying, serving, etc all take on a certain pleasantness of the ego if we know that others will find out about our spiritual accomplishments and think well of us. The "secret of spiritual success" whether in fasting or any other supernatural endeavor of course is a lifestyle of surrender to our Resident Guide and Teacher, the Spirit of Christ, Who leads us into all righteousness. Because of the believer's identification or union with Christ in His death, burial and resurrection. (See discussion of "Crucified with Christ - Galatians 2:20), we now have His potential within us to enable us to "walk in newness of life" (resurrection power) (Ro 8:4-note), energized by the indwelling Holy Spirit (Eph 3:16-note; Ep 5:18-note). And when we allow Him to fill us and control us, we can fast for the glory of God, caring less for the notice (and praise) of men. Hallelujah, what a great salvation! In secret - Fast with the clear intention of being seen by your Father, not by men. What Jesus is doing with these words in Matthew 6 is testing our hearts to see if God himself is our treasure. He is press­ing fasting from the external to the radically internal, and making it a sign of our true Godwardness. “To Judaism, a fast was an outward sign of an inward condition. To Jesus, a fast was an inward sign of an inward condition.” He is testing to see if the admiration of other people or even the spiritual effect on others of our piety has become the God-supplanting food that entices our soul. How do we feel when nobody else knows what we are doing? How is it when no one is saying, “How goes the fast?” Are we content in God when no one but God knows that we have done what we ought to have done? building His kingdom, not your own. Matt 6:4 that your alms may be in secret; and your Father who sees in secret will repay you. Matt 6:6 “But you, when you pray, go into your inner room, and when you have shut your door, pray to your Father who is in secret, and your Father who sees in secret will repay you. Will reward you - Is not the fact that we are pleasing to our Father reward enough? And yet Jesus says He will reward us. It is good and right to want and to seek the reward of God in fasting. Jesus would not have offered this to us if it were wrong to reach for it. Seeking the reward of the Father is not irreverent or unloving or contrary to true virtue. When you serve God, do not expect a reward. Be prepared instead to be misunderstood, suspected, and abused. An evil world cannot speak well of holy lives. The sweetest fruit is most pecked at by the birds. The tallest mountains are most battered by the storms. The loveliest character is the most assailed. If you succeed in bringing many to Christ, you will be charged with self-seeking, or popularity hunting, or some such crime. You will be misrepresented, belied, caricatured, and counted as a fool by the ungodly world. There are rewards that do not sully motives. A man’s love for a woman is not mercenary because he wants to marry her, nor his love for poetry mercenary because he wants to read it, nor his love for exercise less interested because he wants to run and leap and walk. Love, by definition, seeks to enjoy its object. What was Anna's reward? Because of Anna's hunger for God (fastings and prayers), He granted to her the gracious insight of recognizing His Son, her Messiah. The Pharisees fasted often, and made long prayers, but they served themselves, and their own pride and covetousness, in their fastings and prayers; but this good woman not only did that which was good, but did it from a good principle, and with a good end; she served God, and aimed at his honour, in fasting and praying. Note … Those that are diligent and faithful in improving the light and means they have shall have further discoveries made them. Anna is now at length abundantly recompensed for her attendance so many years in the temple. Thy Father which is in secret,… which seeth in secret. How fondly Jesus repeats these words (Matthew 6:4, 6, 18). Though compelled to live so much in the public gaze of men, his heart was always sighing for the secret place of fellowship with his Father, who waited for Him there. Of course, the main object of those paragraphs was to withdraw his disciples from the excessive outwardness of the age in which He spoke, and which necessarily detracted from the singleness, directness, and simplicity of the religious life. It is impossible to perform our religious duties before men, without insensibly considering what impression we are producing, and how far their estimation of us is being enhanced. And in so far as we seek these things, the stream is contaminated with mud and silt, and becomes turbid. We have just as much religious life as we show to God in secret — just that, no less, no more. Whatever is not wrought between thee and God, with no record but his eye, is chaff which the wind driveth away. Here is a test for our alms, our prayers, and our fasting from sin and self-indulgence. If we do any of these to maintain or increase the consideration that men have of us, they count for nothing in the eve of God. But whatever is done for Him alone will secure his inevitable notice and reward. Dwell on that very definite assurance: “Shall recompense thee.” There is no doubt about it. For every petition breathed into his ear; for every sigh and tear; for every abstinence from sin and self there will be a certain recompense, after the Divine measure. Such seeds shall have a prolific harvest. Seek then the secret place, where prying eyes cannot follow, and curious ears cannot overhear. A Place To Grow: “I’m limited,” you say. You are frustrated by the cramping restrictions of age, illness, a difficult child, or an uncooperative spouse. Perhaps you are housebound or bedridden and feel you have no place to serve. Your limited place need not limit you. Embrace it as a place to grow. Don’t worry about what people around you may think. God sees what is done “in secret” and He will reward you in due time (Matthew 6:18). In fact, our restrictions are part of God’s plan to mature us—to draw us away from our preoccupation with being seen and heard by others. If we pray, give, or fast to increase others’ estimation of us, we will miss God’s blessing. If we are concerned about enhancing our reputation, we lose the good that God has promised to give us. God always rewards hidden spirituality. He hears every private prayer; He recognizes every secret gift; He notes and richly rewards each unseen act of devotion. You will be strengthened, and the Lord will make you all that He wants you to be. To know that God sees us brings both conviction and comfort.